If I were a person of color in Florida, I would pick up a brick and start walking toward that courthouse in Sanford. Those that do not, those that hold the pain and betrayal inside and somehow manage to resist violence — these citizens are testament to a stoic tolerance that is more than the rest of us deserve. I confess, their patience and patriotism is well beyond my own. Behold, the lewd, pornographic embrace of two great American pathologies: Race and guns, both of which have conspired not only to take the life of a teenager, but to make that killing entirely permissible. I can’t look an African-American parent in the eye for thinking about what they must tell their sons about what can happen to them on the streets of their country. Tonight, anyone who truly understands what justice is and what it requires of a society is ashamed to call himself an American. 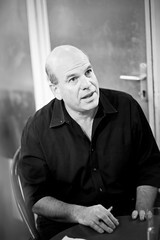 Read More David Simon: “I can’t look an African-American parent in the eye” – Salon.com. This entry was posted in News from the Soul Brother and tagged african american, crime, David Simon, Florida, George Zimmerman, gun control, guns, Law Enforcement, Legal issues, Person of color, The Wire, Trayvon Martin, United States, Wire. Bookmark the permalink.